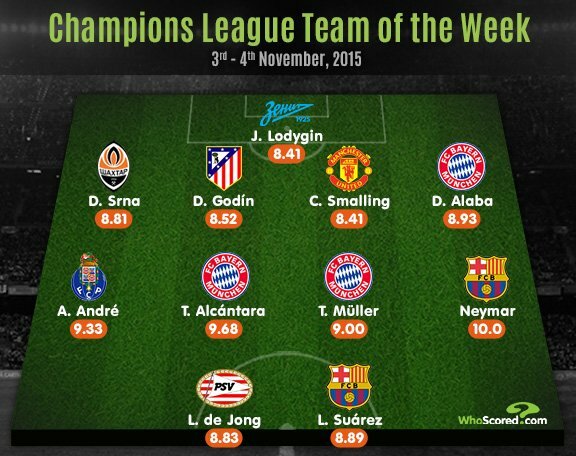 After thrashing Arsenal 5-1 last night, Bayern Munich dominate the WhoScored Champions League Team of the Week but Manchester United defender Chris Smalling has also made the cut. United took a huge step towards qualification to the knockout stages after beating CSKA Moscow 1-0 at Old Trafford on Tuesday night. Wayne Rooney grabbed a 79th minute winner but it was Smalling who once again impressed at the back. The England international is enjoying an excellent campaign and marshalled United to a fourth consecutive clean sheet to earn a score of 8.41 which was enough to see him named in the Team of the Week. Undoubtedly the team performance of the week must go to Bayern Munich after they thrashed Arsenal 5-1 last night and it’s no surprise to see three of their players make the cut. David Alaba capped off an excellent display with a superb goal, Thiago Alcantara was voted as the Man of the Match for his outstanding display in the middle of the park while Thomas Muller scored a brace to help ease the German giants to victory, and all three have been made it into the Team of the Week. Barcelona duo Luis Suarez and Neymar also make the eleven this week after helping the Catalans to a 3-0 win over Bate Borisov.